Author: Kip Hansen / Source: Watts Up With That? 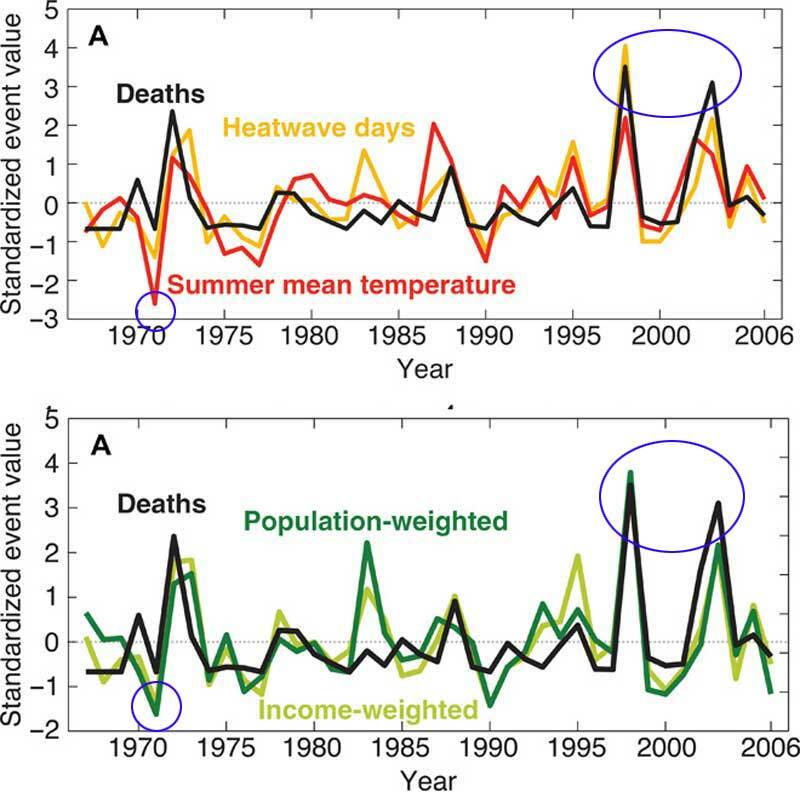 The venerable NY Times carries this headline: “In India, Slight Rise in Temperatures Is Tied to Heat Wave Deaths”. The rest of the study, the story and the claims are the result of questionable statistics, which even the study authors admit (or brag) are “novel”. Temperatures increased substantially if we look at a National Average (mean) — the actual increase in the National Mean Summer Temperature trend is from 27.55 to 27.9, an increase of 0.35 °C ) or 0.63 °F. (Note: not the claimed 0.5 °C, which is a rounded up exaggeration) In the fifty (50) years of the data set, this gives an increase of 0.07°C/decade. 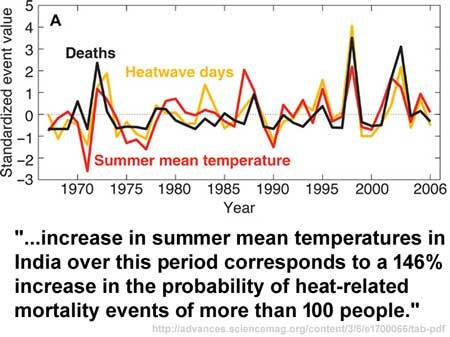 This increase we will simply have to accept as valid, though we must point out that the National Average Summertime Surface Air Temperature may not be the best metric to use to judge what are obviously very localized heat wave events, according to the sub-panels B thru E, and may be skewed by UHI effects in India’s massively huge urban centers. 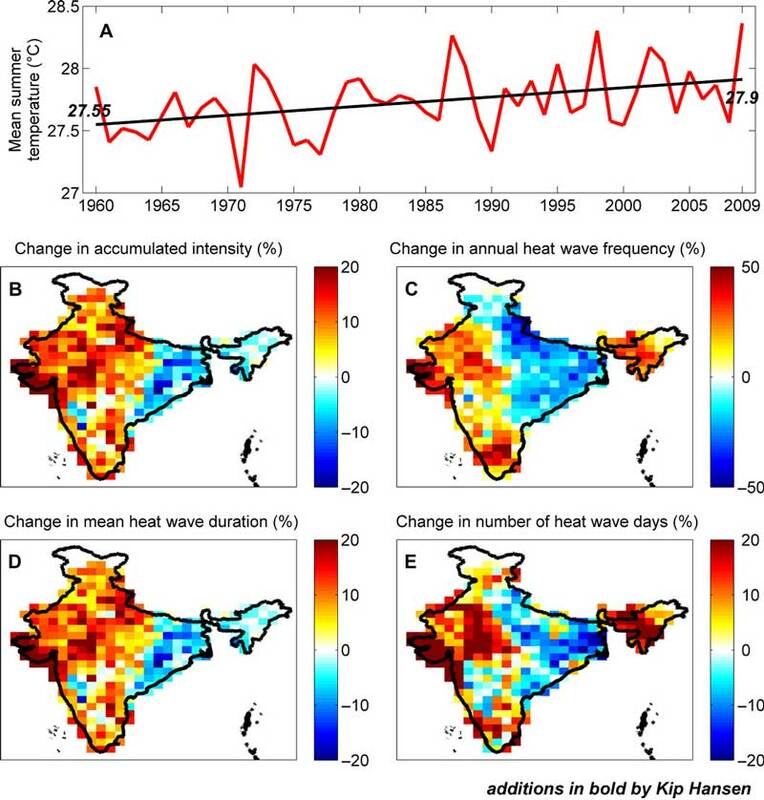 India is huge and geographically diverse — from the tropical southern provinces to high Himalayan plateaus — making a “national” average temperature meaningless in this context. The primary feature of these two graphs is that they are long-term flat, with a couple of spikes and dips.